The second X-47B demonstrator aircraft, AV-2, completed its first flight on 22 November at Edwards Air Force Base, California. The tail-less aircraft’s centre fuselage, wings, bay covers and actuated doors are produced by GKN Aerospace and contain a lightweight aluminium, titanium or composite substructure that is covered by several hundred square feet of durable, lightweight carbon reinforced composite skins. GKN Aerospace teams at its development centre in Nashville, Tennessee, and manufacturing operation in St. Louis, Missouri, developed and produced more than 650 metallic and composite structures and assemblies for each aircraft. "GKN Aerospace is extremely proud to have designed and built a large portion of the X-47B’s complex, high performance metallic and composite airframe. We look forward to the continued success of this transformational Navy programme over the coming years." The X-47B is a strike fighter-sized unmanned aircraft currently under development by Northrop Grumman as part of the US Navy’s Unmanned Combat Air System Carrier Demonstration (UCAS-D) programme. 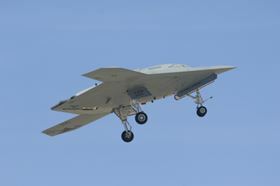 Under a contract awarded in 2007, Northrop Grumman designed, produced and is currently flight testing two X-47B aircraft.